Well, here they are again. 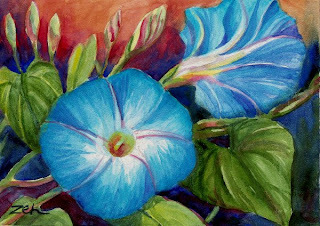 I told you that I can't stop painting morning glories. It's amazing that they are still blooming here in New England in mid-October. They are totally susceptible to the slightest frost and usually they are gone by now. But though it did get cold the other night, it wasn't cold enough to harm these beauties. It's lucky, too, because they take so long to finally bloom. This year we will have had almost two months of blooms by the time they are frostbit. Who knows, if it stays warm enough, even more. So, to celebrate October Heavenly Blues, I've painted them with a bit of autumn color in the background.